Are you a cat lover? Metalhead? Do you like coloring books? Well, if you said yes to all three: Hoo-boy, are you in luck! 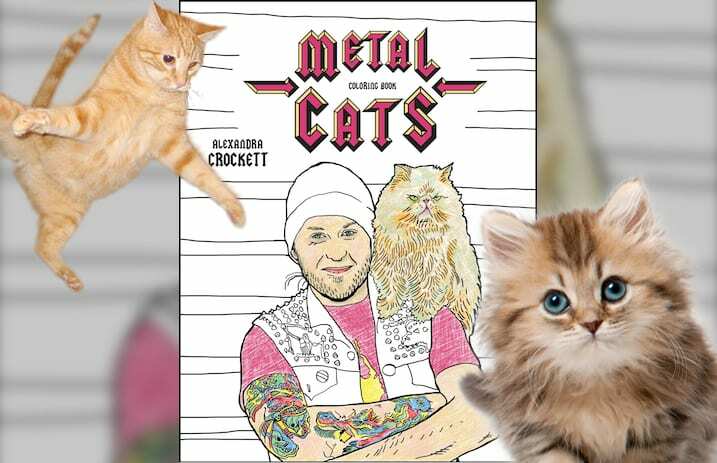 Musician and artist Alexandra Crockett is unleashing her Metal Cats Coloring Book on the world this summer! To be published by powerHouse Books for release this July, the Metal Cats Coloring Book is based on photos from the original Metal Cats book, which features myriad metal artists (Napalm Death, Cattle Decapitation, Municipal Waste, Exhumed, etc.) posing alongside their favorite feline friends. Now, Crockett and illustrator Chuck Gonzales have taken that idea and expanded it into a cool coloring book for all you headbanging ailurophiles! Pre-order the Metal Cats Coloring Book and get a closer look inside right here. Watch more: APTV correspondent Tori Kravitz unboxes “The Box” by Alternative Press!